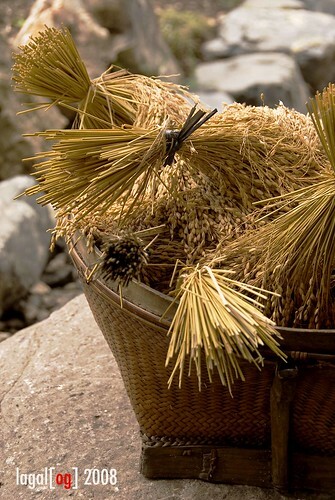 The rice crisis in recent memory brought to the fore a staple that a lot of us may have taken for granted. the country's rice production, For one, was put into question. Ssome sectors said it was a matter of more prudent rice consumption. Still others questioned why our country, which used to be among the world's top producers, is now importing rice. Some quarters said it was due to global warming. Fastfood outlets and restaurants pitched in with half-orders of rice in the menu. Other marketing-savvy establishments pitched in with rice alternatives.B ut clearly, there was a problem boiling over somewhere. I'm no sociologist or expert but as an observer, I'd skip the arguments and instead, focus on what I've observed in the highlands. For years now, there have been talks and stories about how the current generation has veered away from farming, lured by jobs and the promise of a better life in the cities and elsewhere. Watching the terraces makes one ponder that no matter how important one's job is, the basics like rice farming are really far more vital to our existence.I was born into a family with farming roots and when I was younger, I can't imagine why on earth my late father wanted to go back to the fields after my siblings and I finish schooling. Now, I find myself in this position of dreaming of having a farm and putting my green thumb to better use. In any case, I dedicate this post to the rice farmers. their daily toil under the sun and rain makes it possible for us to enjoy our platefuls of rice each and every day. another nice shot oggie. this post is interesting as you share something that you find very interesting like owning a farm. we actually have a farm in our province. we still earn from it but i never had the chance to really try rice milling. you gave me the idea of visiting it and do some farm work. i hope that you'll own a farm someday. i have a green thumb kasi dom and i connect to the earth. i don't know exactly how to explain it but there's something about agriculture that i feel strongly about. i do hope that dream of a farm comes true someday. my father used to be a farmer too and this post is a great tribute to him and to all other farmers specially in my ricebowl province of nueva ecija. if i may add, one observation i had is that most agricultural lands are converted for residential or commercial purposes. a decreased land ti till means a decreased palay to be harvested. oman, you're right. residential development is really encroaching on agricultural lands and this has impacted on the volume of rice production. this post is a tribute to all our farmers, whether they hail from the highlands or lowlands. without them, we wouldn't be eating our daily fill of rice, something a lot of us probably never even pay much attention to until the rice crisis loomed. i like the sensitivity and the relevance of this post. my work basically revolves around agriculture and science, working for the farmers. the last one is more of a conviction on my part, i'd like to think somewhere beyond this mundane work is a (good) cause. our problem in rice has gone beyond the obvious. but i won't bore you with that i am just happy for this post, a tribute to the farmers. admist the hullabaloos of rice production everything has gone down to politics and rotten system, we often misplaced the real heroes, our farmers. thanks for the insightful comment, my gulch. believe me, i'mn not easily bored with insightful replies such as yours. it's just that there were a lot of factors that contribute to the problem and some of them are hard truths many of us may not want to confront. thanks again for dropping by. i'm proud to say that i also grew up in the farm and have fond memories of the green fields.my family in ilocos never experienced lining up to purchase rice,thank God.. I really miss the view and smell of the green fields.. Thank you for paying tribute to the farmers-the backbone of the country!! anyway, i can relate to your missing the view and the smell (aroma?) of the field lalo na pag mahamog. i think the farmers are unsung heroes who deserve more attention. kung hindi sa kanila, hindi tayo kakain. I think there was no real "rice crisis"... makes me think of the gasoline prices... a lot of people speculating... and making lots of money out of it. Sice picture... like the composition. hi sidney! heard nga from ferdz you're back. nice to have you here again. anyway, i understand there are quarters out to make money out of the shortage. whatever the real situation is, one thing is apparent - we ought to be more self-sufficient in rice production.